Earn your master's degree in one year. No GRE required. Become a scientist and get published. Graduate assistantship and tuition waiver available to qualified candidates. Get the applied experience to enter the workforce. 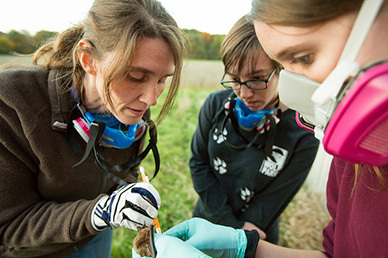 The graduate program in Biological Sciences affords students an opportunity to pursue advanced training in many of the major disciplines of the biological sciences. Students specialize in one or more areas of the biological sciences including conservation biology, ecology, ornithology, gene expression and development, bioenergy, plant anatomy, fisheries biology, bacteriology, wildlife biology, behavioral ecology, toxicology, parasitology, phylogenetics, evolution, morphology, community ecology, adaptations, mitochondrial physiology, neuroscience, Alzheimer's disease and neurodegenerative diseases, ecological genetics, algal ecology, behavioral ecology and genetic engineering. In addition to well-equipped laboratory facilities, computer facilities, a scanning electron microscope facility, biotechnology center, G.I.S. laboratory, extensive herbarium collections, and a multi-room greenhouse for teaching and research, a number of outdoor facilities, including state parks, nature preserves, local streams, rivers, reservoirs, and watersheds are available for field studies. The thesis track option is our “standard” degree and is designed for students seeking to gain expertise in scientific research. It allows students to design, implement, and analyze an original research project, in cooperation with their graduate research committee. Click here for more information on the Thesis Option. The internship track option is designed for students seeking applied experience in the field, outside of the university setting, as a means to enter the workforce. Students find and complete a internship in an appropriate setting, which incorporates an independent study/research project, to complement their coursework. Click here for more information on the Internship Option. The Non-Thesis option allows students to earn a master's degree in one year without having to take the GRE. The curriculum is flexible and helps to fill requirements to teach K-12 and in higher education. Click here for more information on the Non-Thesis Option. 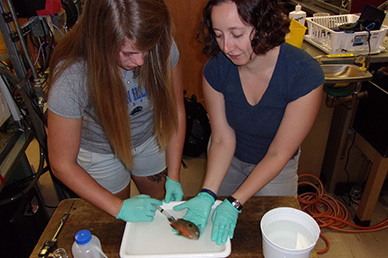 Students work closely with faculty advisors to conduct research in any of several areas of biological sciences. 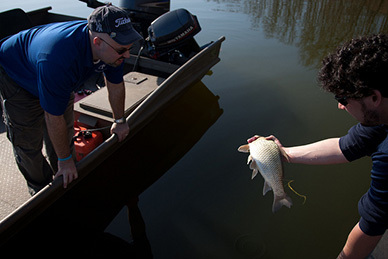 Graduate faculty research interests and expertise span the gambit, allowing students to design a research project in any sub discipline from organismal and field biology to physiological, cellular and molecular biology. Students in the program are part of an academic community. They interact closely with faculty members – both academically and socially. They are involved in mentoring of undergraduate students through teaching assistantships and research. “My research is driven by an interest in understanding wildlife-habitat associations. My research projects are diverse but aim to understand the factors explaining why species occur where and when they do, patterns of animal movement in search of suitable conditions, and the consequences of movement and habitat selection on fitness and species distributions at various scales." "My research focuses on how fish interact with the environment from a biomechanics perspective. We investigate how fish fins, teeth and eyes have evolved to give each species the capacity to explore a certain habitat. Undergraduate and graduate students are highly encouraged to contact me by phone or email about current research opportunities."